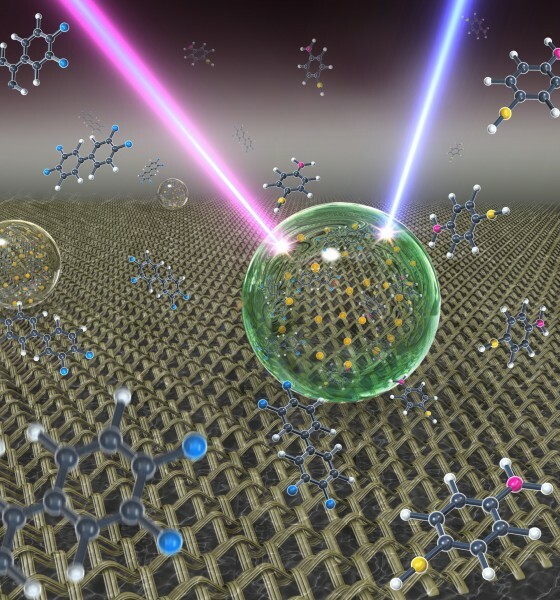 Penn State researchers have invented a way to detect single molecules of a number of chemical and biological species from gaseous, liquid or solid samples, with applications in analytical chemistry, molecular diagnostics, environmental monitoring and national security. “Being able to identify a single molecule is already very difficult. Being able to detect those molecules in all three phases [air, liquid, or bound to a solid] — that is really challenging,” said Tak-Sing Wong, assistant professor of mechanical engineering and the Wormley Family Early Career Professor in Engineering. Although there are other techniques that allow researchers to concentrate molecules on a surface, those techniques mostly work with water as the medium. SLIPS can be used with any organic liquids, which makes it useful for environmental detection in soil samples, for example. One of the researchers’ next steps will be to detect biomarkers in blood for disease diagnosis at very early stages of cancer when the disease is more easily treatable. Their work appears an open-access online paper in Proceedings of the National Academy of Sciences (PNAS). It was funded by the National Science Foundation. * Raman spectroscopy is a well-known method of analyzing materials in a liquid form using a laser to interact with the vibrating molecules in the sample, generating scattered light. But the molecule’s unique vibration shifts the frequency of the photons in the laser light beam up or down in a way that is characteristic of only that type of molecule, allowing it be uniquely identified. However, the Raman signal is typically very weak and has to be enhanced in some way for detection. In the 1970s, researchers found that chemically roughening the surface of a silver substrate concentrated the Raman signal of the material adsorbed on the silver, and SERS was born. Wong developed SLIPS as a post-doctoral researcher at Harvard University. SLIPS is composed of a surface coated with regular arrays of nanoscale posts infused with a liquid lubricant that does not mix with other liquids. The small spacing of the nanoposts traps the liquid between the posts and the result is a slippery surface that nothing adheres to. If a droplet of liquid is placed on any normal surface, it will begin to shrink from the top down. When the liquid evaporates, the target molecules are left in random configurations with weak signals. But if all the molecules can be clustered among the gold nanoparticles, they will produce a very strong Raman signal. Many analytes in real-life samples, such as body fluids, soil contaminants, and explosives, are dispersed in liquid, solid, or air phases. However, it remains a challenge to create a platform to detect these analytes in all of these phases with high sensitivity and specificity. Here, we demonstrate a universal platform termed slippery liquid-infused porous surface-enhanced Raman scattering (SLIPSERS) that enables the enrichment and delivery of analytes originating from various phases into surface-enhanced Raman scattering (SERS)-sensitive sites and their subsequent detection down to the subfemtomolar level (<10−15 mol⋅L−1). Based on SLIPSERS, we have demonstrated detection of various chemicals, biological molecules, and environmental contaminants with high sensitivity and specificity. Our platform may lead to ultrasensitive molecular detection for applications related to analytical chemistry, diagnostics, environmental monitoring, and national security.